I know what you're thinking, "What could R.L. Stine and the holidays have in common?" Well, if you know anything about this legendary, young adult fiction author's oeuvre (he's sold over 400 million copies of his various books), then you know that it covers a lot of ground. Sure, Halloween is well represented but other holidays certainly have their due as well. With Christmas approaching and reading becoming a lost art, it only seems right to merge horror and yuletide cheer with, 5 R.L. Stine Books for the Holidays, especially seeing how R.L. announced that new books are on their way. As I researched all the works of this prolific, young-adult fiction author, it became clear to me that Stine's works have covered a lot of ground. Considering that the popular Goosebumps series alone has sold over 200 titles, one can only imagine how many books the Fear Street, Mostly Ghostly, Rotten School and The Nightmare series have sold. (This says nothing of the one off books he has written!) However, what I wanted to do with this list was to distill it down to some essential R.L. Stine titles. While this list may look a little slim given the the author whose work we're covering, it makes sense when we look at it in the context of the holidays. I say that because R.L. Stine, despite mostly working in the young adult fiction genre, doesn't appear to enjoy repeating himself. Sure, when you read 50 to 100 of his books there is going to be some plot overlap, but that doesn't mean that the story remains the same. Another interesting thing about this list is how it makes Christmas scary, and at the same time brings us back in time with a book like, "Young Scrooge: A Very Scary Christmas Story." It is R.L. Stine's ability to move through these macabre worlds that has made him beloved to so many readers. Each book feels layered, rich, and in no way a pedestrian exercise. Surely, some books are better than others but on this list is seems like each book is its own individually wrapped holiday gift. So sit back and prepare to get some more gift ideas with "5 R.L. Stine Books for the Holidays." With so many younger people wanting to consume light content, R.L. Stine books provide that while at the same time offering up food for thought. They show young people having to make real world, split second decisions, and the books are old enough to show that there's a way to achieve success without turning to the internet for every little thing. Reva Dalby is the kind of character that readers love to hate. So it makes sense that R.L. Stine would make her the star of not one but three books. The "Silent Night" series follows this character as she rudely disses everyone around her, only to ultimately get her comeuppance. Even when she vows to change (as is explored throughout the books) we see that Reva, like many, will never change. Reva has a reputation in Shadyside and it truly seems like nothing that happens to her will serve as a vehicle for true character enlightenment. That is what makes this read so special. It presents flawed characters in situations that are ever evolving and changing. The holidays are all about growth. About making resolutions to improve ourselves. Reva, whether she is being stalked, terrorized, or the victim of revenge, always reminds us that not everything we experience will serve as a life lesson. Sometimes it's fun getting to follow a mean person around and seeing that their perspective isn't that much different than our own. This story, which is part of the "Ghosts of Fear Street" series, somewhat takes the idea of "A Christmas Carol" and turns it on its ear. The story follows a real meany named Kenny Frobisher. He pushes people around, he's rude, and he basically can't go through a day without doing something mean to somebody. Things change when he finds himself trapped in the closet of a department store on Christmas Eve. This seems like the right fate for such a rude no-goodnik, but things really take a turn when Kenny gets out of the closet and has to contend with the ghosts of fear street. What they have in store for him is a lesson in kindness that he is going to learn no matter what the cost. Filled with humor, fun, and spine-tingling moments, "Fright Christmas" is a must have for this holiday season. Just when you think you have a beat on where this story is going, when you think you have the scares in check, something happens that will upend all of your expectations. People young an old will enjoy reading this tale that really shows how even a little holiday cheer can go a long, long way. "Beware the Snowman" is from the famous "Goosebumps" series and will leave you scared of snow and just as white! With the tag line, "He's got a heart of cold! ", the stage is set for one of the most devilishly scary holiday stories you will ever read. After moving with her family to the Arctic Circle, Jaclyn feels like she is in the hub of nowheresville. There's absolutely nowhere for her to go and even less for her to do. The one thing she does have is snow... and lots of it. So imagine her surprise when she comes to find out that there's snowmen in front of every house and they have malice on their frozen brains. 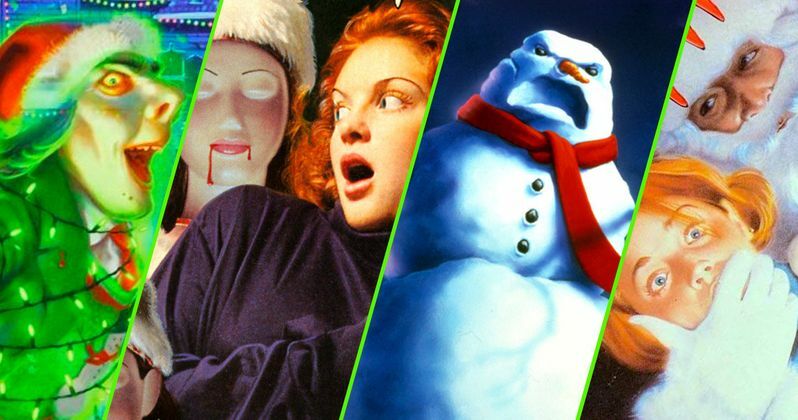 "Beware the Snowman" is a truly fun romp because who other than R.L. Stine would come up with a killer snowman. We often think of these frozen beasts as fun and cool, but you will never look at snow the same way after reading this book. Read it to your kids or the entire family. Heck, put on some hot coco and just sit back and enjoy this tale from the holidays that just keeps giving and giving. The best part? "Beware the Snowman" is the kind of book that can be passed down from generation to generation and always leave new readers with the chills! Rick Scroogeman is a curmudgeon of the highest order. He severely dislikes everything about the holidays... especially Christmas! He doesn't want to hear the songs. The lights and all of the colors make him want to vomit. If Rick was older this might make more sense, but the fact that he is in middle school only makes things worse. For Rick Scroogeman there is simply no escaping Christmas. Making matters worse is that, during this time of year, all the students at his middle school shorten his last name to "Scrooge." One night Rick is visited by three ghosts and they have a very different idea of the way Rick should view his life. What unfolds is a truly R.L. Stinesque tale as the ghosts show him the past, present and future. Sure, this book may ultimately play by the rules of "A Christmas Carol," but it is very true to what readers expect from this author. There are thrills, chills, and terror lurking behind every page. At the same time there is the life lesson of this classic story that can't be denied. Make your holiday a little more interesting and invest in this book for your family. Another book that is part of the "Goosebumps" series, "The 12 Screams of Christmas" features a dazzling cover with a ghoul wrapped in Christmas lights wearing a Santa Claus uniform. This ghastly story gives us Kate Welles, a young lady who wants nothing more than to star in the school play, "The 12 Screams of Christmas." This goal is upended when her friend Courtney gets involved. Courtney is Kate's best frenemy. The two of them have to work together otherwise neither of them can be in the play. Things take a turn when their drama teacher wants them to rehearse in a scary house. The house is known for being really creepy. Kate hates places like this but she has no choice because being in the play is priority number one. So Kate goes along with this idea only to have her dramatic desires be severely tested. So many of R.L. Stine's greatest books are about need. His young characters want things. They get them very early on with little to no effort and from that moment on their lives become hell. The set-up is so good and R.L. Stine so adept at stringing his characters and readers along, that we both never really give up the hope of holding onto that which has been earned. However, this is our failing and it's the very thing that makes us keep reading. We hope and pray that the characters will get what they deserve. And if they don't? We just pick up another book, right? This is sort of a microcosm for the holidays. We want things, we get things, and we give things. Do we always get what we want? Hardly. However, it's the idea that we're merely going to be getting gifts, that we're going to get to share our time with people that we care about, that oftentimes keeps us in the holiday game.